opportunities in Rishikesh to do whatever you like, folks of all age groups set their feet in the city, only to gather unforgettable memories. Rishikesh is one of those destinations in India that offers picturesque views around the year, although May, June, and July are the hottest months when the temperature crosses 35-40 degrees Celsius. During July, the monsoon festival called Saavan takes place in Rishikesh, which attracts a footfall of millions of people from North India. During this time the major highways and roads are either closed or highly congested, and the hotels are packed with guests. If you are willing to go for white water rafting, you must come from September to mid-November, and from March to May. The water of the Ganges is freezing cold during December and January, though a few adventurous souls still go for water sports at this time. The youthful populace of India has made Rishikesh a hit among all tourist destinations of North India. 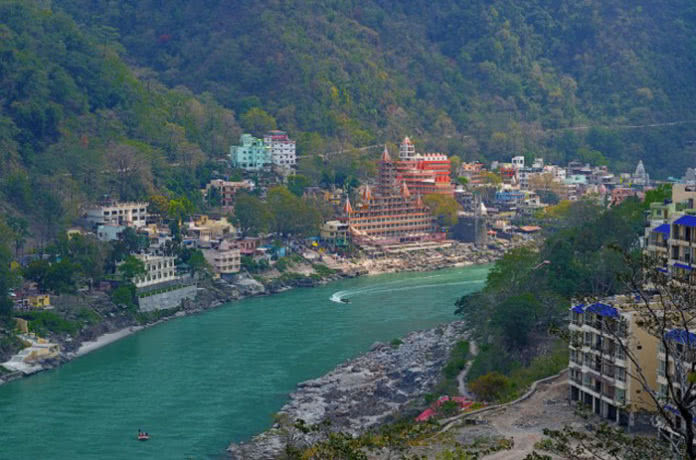 The ancient city of Rishikesh is not just another religious site of India. Even though the list of things to do in Rishikesh may sound similar to what you have done in other cities, you will definitely find a different aura of things, people, and places. The Ganga Aarti at the Triveni Ghat is a magnificent sight that attracts its beholders. It is an awestruck feeling when the pandits or religious priests blow the conch shells or ‘shankh‘ to begin the prayer. After sunset, the entire ghat or the bank of the Ganga river lights up with earthen lamps and electric lights. There was a phase when no one in India knew about Rishikesh. Continuous visit of the great music band, the Beatles, at Maharishi Mahesh Yogi Ashram to learn transcendental meditation brought it into a highlight. 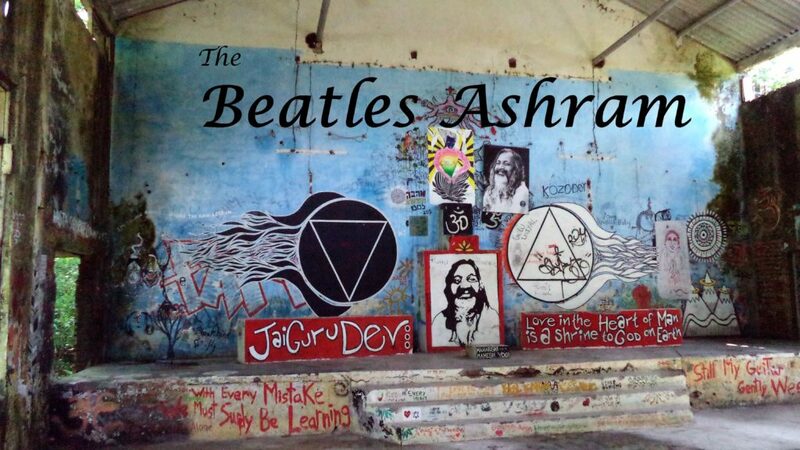 Although the Beatles Ashram is abandoned now, the place has a lot of graffiti that shed some light on the time that the band had spent in Rishikesh. If you ever thought of learning yoga and meditation, Rishikesh is the best place to do so. Even though many people associate only adventure sports with the city, yoga is an integral element of Rishikesh. You can learn yoga from practitioners residing in the tranquil ashrams. An extended stay in Rishikesh can be demanding on your mind and body, but you can relax and rejuvenate your energy at an Ayurvedic massage center. The scented herbal oils used in the massage are known to have long term effects on the human body if you use them for a decent time. Just like many hill stations in North India, Rishikesh is also dotted with a lot of cafés that serve lip-smacking food. Café Delmar, also called Beatles Café, is usually overcrowded with people. You can also go to Café De Goa or Café Karma to have some of the exquisite dishes from different nationalities of the world. White water rafting in the Ganga River is the most popular adventure sport in Rishikesh. You don’t have to struggle much to find the best providers of this sport as there are plenty in the region. You can easily find out the best rates on the spot, though you must make prior bookings during peak season. Unless you are scared of heights, you will love to jump off the platform created at an altitude of a whopping 84 meters. Give yourself a chance to jump from a grand height, and you will cherish the moment forever. 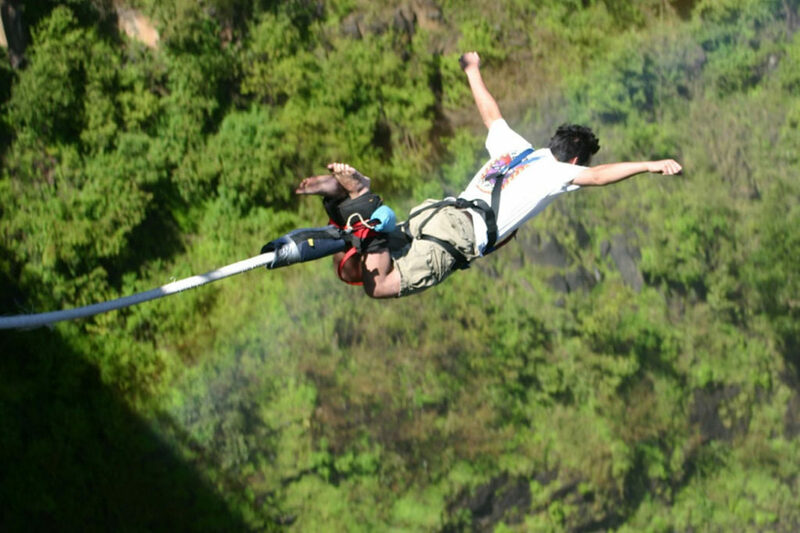 You can also get yourself clicked or get a video recording of your jump. The giant swing, as the name suggests, takes you to a bravura journey of an enormous back and forth movement like that of a pendulum. You can stop at the termination point of the swing after a few seconds with the help of an assistant. Imagine flying over the River Ganga from one side to the other like a flying fox. Get a bird eye view of the city. Although the entire experience gets over in a few seconds or barely a minute, you will still feel the ecstasy for many days afterward. Staying in the camp facing the magnificent mountains is delightful. With all the facilities that you get in most of the camps, you will actually get the feeling of being attached to the roots while enjoying the modern luxuries. Cliff jumping is similar to bungee jumping, but the difference is that of the height, and you have to jump into the water of the Ganga River. You have to leap directly into the river, which is not an easy task for many people. If you plan to come to Rishikesh from a great distance, you can take a flight to Dehradun, which will land at Jolly Grant Airport. The airport is located at a distance of 35-40 kilometers from Rishikesh. You can take a cab from Dehradun that can take you to Rishikesh. The city is well connected with buses from New Delhi, Dehradun, and Haridwar. All kinds of luxurious and regular buses are available to reach Rishikesh. You can also take a train to Rishikesh, though you will have to alight at Haridwar, which is 25 km away. Haridwar Railway Station is well connected to almost all parts of India through Indian Railways. 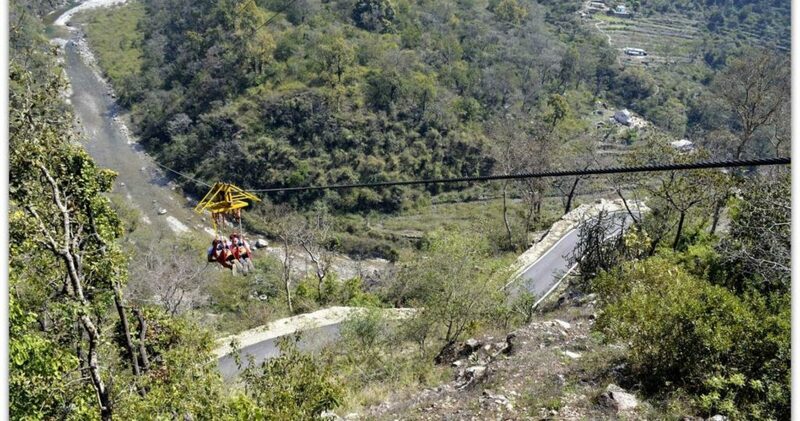 For those who love road trips, it is a smooth ride to Rishikesh through National Highway 58. A few stretches on this road may be somewhat bumpy, but it is still an exciting ride. You will need to drive for 6-7 hours from New Delhi to reach your destination via Haridwar. It is a great idea to hire a Self-Drive Car in Delhi, perhaps an SUV, which you can drive to Rishikesh for the grand experience of a road trip. Since the city is a popular tourist destination among Indians and foreigners, you have plenty of options to stay. You can book a hotel, guest house, villa, luxurious resorts and homestays in and around the central city. If you love to live the rugged life for a day or two, a stay in the riverside camp can be a joyous experience. Yoga ashrams are also very popular among people who want to learn yoga and meditation. The ashrams are not only cheap options to reside for a long time, but they are also a life-changing experience. 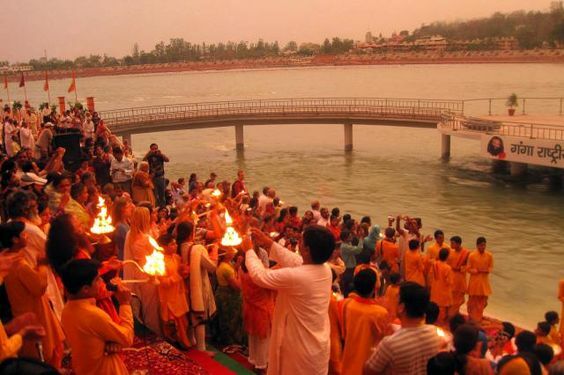 Haridwar is the most common and nearest city close to Rishikesh where you can go for a two-day visit. The overall environment of Haridwar is religious as you will find temples and religious activities going on throughout the city. The banks of the River Ganga or ghats are magnificent places to take a dip in the river and witness the glorious Ganga Aarti. 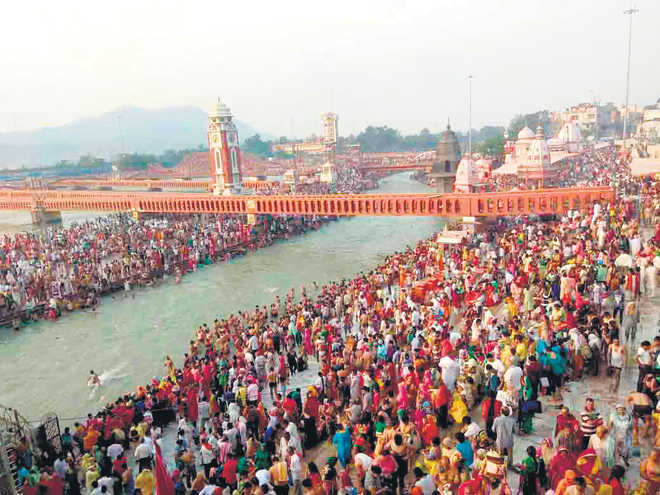 The Har ki Paudi attracts thousands of pilgrims every day during the peak season who wish to bathe in the holy river and then sit by the river to blend in the religious environment during the aarti. Take a visit to the markets and experience the sound of the bells, the fragrance of camphor burning at several places, and plenty of devotees everywhere. The capital city of Uttrakhand offers a lot of exciting getaways for the tourists. The Ganga and Yamuna border the city and make it a glorious place to have a weekend getaway. Robber’s cave, Tapovan, Rajaji National Park and Tiger Falls are some of the famous sites in Dehradun where you can spend a great time with friends or family. 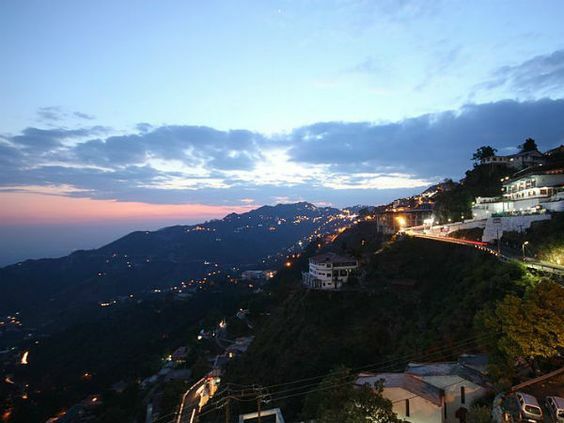 Dehradun is located at a distance of 35-40 kilometers from Rishikesh. You can easily drive a car or take a cab to reach there. 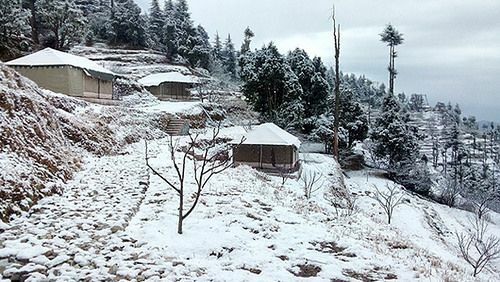 If you are willing to drive for nearly 100 kilometers, you can reach the beautiful town of Dhanaulti. Indulge in activities like trekking to places like Surkanda Devi and Chandrabadni, mountain biking, paragliding, river rafting, and camping. Rishikesh is a place where religion and modern-day beliefs create a beautiful blend. After indulging in challenging activities, it is soothing to relax in the ashrams of the city.